Trendease International · May 2010 / Milan & Much More! May 2010 / Milan & Much More! We bring you a fresh issue jammed with newness and innovation! The most important event for product launches and creative happenings just took place and we were there to get you the scoop: Milan Design Week. The Salone Internazionale del Mobile, SaloneSatellite, and Fuori Salone (made up of 500+ external exhibitions!) are included in the mix of other events we recently visited. See what happens when craftsmanship, creativity, and technology get together and much, much more. Get inspired with the May edition! We attend over 100 design events a year on your behalf to bring you trend insights and design movements to help you maintain cutting-edge knowledge of the lifestyle and design markets. Currently we keep readers in 7,901 cities within 157 countries in the know! Are you reading Trendease.com? Worldwide — Milan was by far the most inspiring happening over the last month. And boy was there loads to see! Locations around Milan from the fairgrounds to the showrooms to some small, hard-to-find events of the Fuori Salone were radiating with design. There were plenty of trends worth pointing out that take into consideration the other events we have attended. 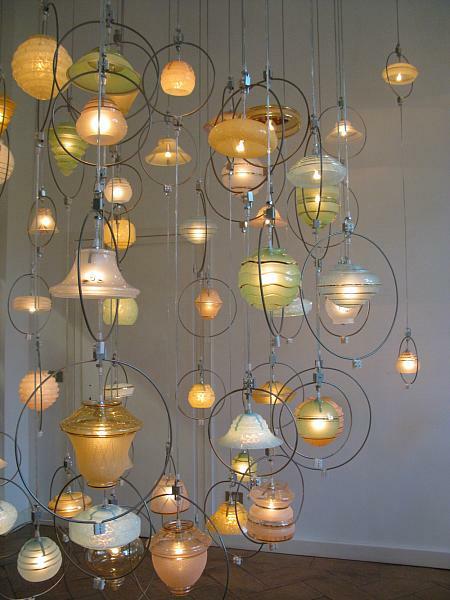 Learn what Jennifer has to say and feast your eyes on a gallery of the most inspiring lighting. Worldwide — The trends of animality and fantasyland were seen emerging at Heimtextil and Maison&Objet, but really collided full-force at the recent design week in Milan. The free play of creative imagination combined with the animal kingdom, not excluding the human anatomy, paved way to new creations in lighting, furniture, upholstery, decorative accessories, tabletop, and more. Multiple European Cities — The building blocks of design are vast and varied. A current and growing trend we have been reporting on is the pixelated style. The word pixelated describes an image in which individual pixels are evident to the naked eye. We have observed this predominantly in the textile sector, but have seen it spread into ceramics, and after our visit to Milan, it is noticeable in furniture category as well, but more as a 3D rendering. Multiple European Cities — Certain home furnishings started to be known as ‘home fashion’ when apparel brands entered into the world of interiors. It wasn’t too long after that, the trickle down time from the runway to the home went from years apart, to a year apart, a season, and now they sometimes parallel each other. In other stories of inspiration fashions from the past are reborn on furniture of the future. This feature is guaranteed to turn heads on the catwalk and in the living room! Amsterdam — Droog came up with a unique concept for Milan Design Week: it saved 5135 items from liquidation sales and repurposed them. The project was brilliantly marketed, boasting fliers, posters, and pictures of some of the proud purchasers of several of the “saved” items. We enjoyed the exhibition, and hope that you will enjoy this feature of products such as the Manicured Chair, Moustache Guard, and Happy Wallet. Milan — What happens when 10 designers leave their studios, away from drawing boards, computer screens, and mechanized equipment and go deep into the woods of the UK? What could come from working without electricity with pole lathes, steam benders and hand tools like it was done oh so many years ago? That is what Designersblock wanted to discover. During the period of March 30th to April 5th, 2010, into the depths of the forest they went, and Milan Design Week was where they unveiled their new, hand-made creations. Milan — These two brothers from Brazil form designs, combining cords, scraps of wood and string, bamboo, Brazilian rag dolls, rubber hoses, Plexiglas and what-have-you, and have caused mayhem in the design universe. Using hand-me-down materials and traditional Brazilian savoir-faire, Humberto and Fernando produce energetic, cunningly thought-out creations that narrow the divide between design and craftsmanship. Worldwide — Contemporarily we see, and hear, a lot of buzz around embracing traditional know-how, and we witness many creatives combining ancient techniques with today’s technology. This gallery shows both, from a variety of talent, and here products are brought together with the common thread of the weave. In this feature learn about a 600 year-old material as well as the latest cutting-edge software developing 2D products into 3D. Worldwide — Using a minimal amount of (sustainable) material, repurposing scraps, local production, as well as practicing and preaching environmentally friendly concepts is what the companies within this feature are doing. And theses aren’t the only people practicing creative responsibility. What part do you take in making a difference? Worldwide — This week’s gallery presents a spiral of inspiration. Around and around we go. What do we uncover? A diversity of circles offering new design directions: varying sizes, layered cut outs, organic forms, flower heads, starbursts, chain links, embroideries, trims, and a cluster of spheres. Bedding, wallpaper, floor coverings, lighting, and furniture will take subscribers for a spin, along with the latest cutting-edge tidbits. Multiple European Cities — This week’s featured trend is nothing new, but it is still ever-present and claiming the spotlight, hence it is something of which you should be aware, and you can find oodles of in this photo gallery. Found at the Salone Internazionale del Mobile, SaloneSatellite, Zona Tortona, and beyond, angles and facets are making up the hottest new tabletop designs, outdoor furniture, lighting, upholstery, and bedding patterns. Also discover a sneak peak of the trends to be unveiled at MoOD 2010. Worldwide — This week’s gallery features the contra trend to last week’s angles. By no means something new, the blobular and organic forms continue going on strong as seen in 2010, at Heimtextil through the five months of events up to current day. Subscribers feast your eyes on a wide variety of on-trend products from tabletop to upholstery to automobiles to lighting and furniture. Also read up on today’s hottest green tidbits! Milan — The photo selection within this gallery supports a trend we have been talking about since January; however, this collection is dedicated to tabletop textiles and ceramics. Subscribers can take a visual jaunt into a world embellished with ikat, ombré, and watercolor effects and read up on the latest tidbits on affordable art and retail investments.